Let’s just say you’ll be able to read something of mine at a very awesome site in the near future! Also, it’s that time of year again!–time to apply to writing workshops. I’m applying to Clarion this year. Odyssey was amazing and wonderful. I learned so much and met great writers many of whom are now my friends and writing partners. 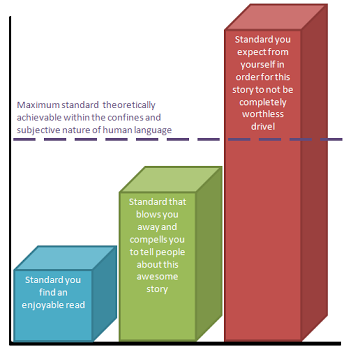 I’ve developed my craft and critical eye (read: I can’t just read a book or watch a movie anymore–I’m constantly analyzing and wondering at the poor writing, or awesome writing, as the case may be). In the mean time, my apologies for having not posted lately. I’ve been writing and revising and general life things. Also, I’ve been thinking about re-working this website and/or starting an official website focusing more on writing and literature/cultural critique rather than the everything I’ve posted about here, in the past (which, granted, includes writing and literature stuff, but a whole lotta other things thrown in there as well). I’ll report on my exciting news soon! Hurray! Thank you for your strength, your poetry, your vision. You made the world a better place for us all. As my mother said: a profound passing. “Woman of Wood” at Goblin Fruit! It is published! 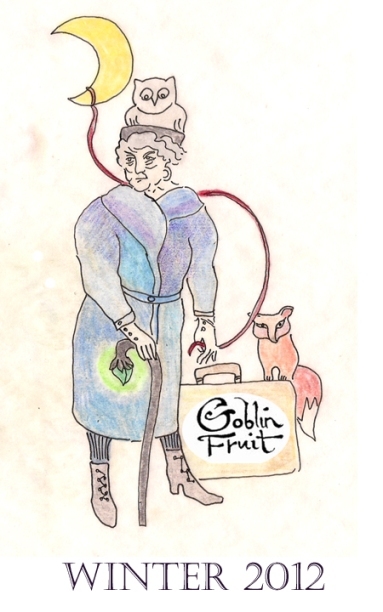 My poem “Woman of Wood” is available in the Winter 2 012 issue of Goblin Fruit along with the poem “Qasida of the Ferryman” by my dear friend Sofia Samatar. You will find many fine and wondrous poems as well as the artwork of Rose Lemberg, the guest artist for this issue. As far as content is concerned, writing of “Woman of Wood” wasn’t the most difficult of poems. I have pieces in my repertoire that I have been working on for years now; pieces where the right metaphors and images, the ones that will bring to life the meanings and emotions I’m looking to share, simply elude me. But “Woman…” was all right there, she practically sprang forth like Athena from my head (or thigh). In a former life I was a wood worker; a residential carpenter, cabinet maker, and painter. There is something about working with wood that is satisfying on a very basic emotional level; the feel of a well-sharpened chisel through wood, the smell of the sawdust, the patterns of the wood grain, building something useful and beautiful with my own hands and back and brain. There is one piece of furniture I had in mind while writing the poem: a beautiful night stand made of air-dried walnut. Because of the drying technique the wood retains more of the complexity of its color than when kiln-dried, which is the more common technique of the two because it is faster (indicative of so many things in our culture – it’s faster so that’s the way we do it, but it is not necessarily “better” and it certainly isn’t prettier, just cheaper). The walnut I used for the night stand is layered with bands of lavender and silver and crimson. Real faerie wood! Gorgeous. I wish I had time and the facilities to make more furniture with that wood. As for the implications of the content, the layers of meaning that brought it about and the layers of meaning that it holds, well those have been forming in my brain and psyche since I was born. You’ll no doubt see shadow images of faerie tales and other popular stories, of cultural norms approached from that fantastic stand point, you’ll hear the wood I worked with speaking through the hands that shaped the wood, and more. Surely there’s plenty of my feminist background stepping forth and commenting on the traditions passed on to me through the two cultures I was raised in. Perhaps I’m commenting on my creative feminine side through the eyes of my male-dominated career self. What was difficult about “Woman…” was the format. That took, let’s see, over a year to figure out. I had the whole thing written in one voice: the now first person her side and the third person his side were all jumbled together. It was a bit of a mess. Powerful imagery and phrasing were there, a unique story, but the story was out of focus, chaotic. It’s that process of thinking, of wondering ‘what is it that I’m really trying to say here,’ otherwise known as editing, that forced me to keep working on the poem and make it better. How these things happen, I don’t know, but there was the moment of epiphany when I realized that what I had written was a story of the woman of wood and her forced transformation as well as the story of how a woman of wood is created, the physical and social forces that shape her. And it occurred to me that these two related stories might be better told as two intertwined stories. It’s the magic of thought we call creativity, that moment… and since writing is how I think, that’s what I do: I rewrite and rewrite and rewrite, because I don’t know what I’m thinking until I write it and analyze it and rewrite it to see if that’s what I meant to say. As the saying goes: don’t believe everything you think. That’s what the process of writing is (that is writing, rewriting, and editing): a better form of thinking. I hope “Woman of Wood” makes you think, and feel, and transports you to another place, a place filled with the sound of axes chopping trees and the snap and crackle of a log thrown on the fire, the smell of fresh sawdust and of woodsmoke. Too much to read – and now there’s even more! Though I may never approach the awesome prolific-ness of Catherynne Valente (really, I simply won’t – she has insomnia, which I do not envy her, while I suffer on the other end of the spectrum) I am encouraged to continue with my writing, because simply knowing it is humanly possible to write that much, is inspiring. Now go read her awesome work.